SOCKCHOCS - New baby or christening gift with a difference. A gift for both baby and mum. Chocolates for mum and socks for baby. 2 x 40g "It's A Girl" chocolate bars. (your own message is printed on the back). 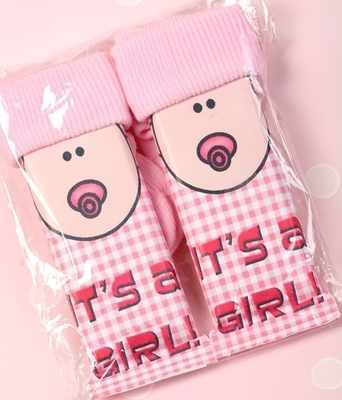 A pair of first size baby socks for the hats (choice of pink or white socks). Sockchocs sealed in cello bag. These sockchocs are only available in the 40g size but you can choose either milk or plain chocolate.